PureOne Impressions: Blog Hop Giveaways!! Sorry for the long absence. My computer stopped working + I had to send it away for repairs. Six weeks later, I'm back!! And now for some fun! 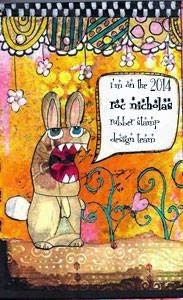 It's blog hop time for the Roc Nicholas Rubber Stamp Design Team, which means giveaways galore! So you have a lot of chances to win some great prizes. Each Design Team member is giving away a piece of mail art, and Roc will also be giving away one of the rubber stamps from her collection! You can see all Roc Nicholas Rubber Stamps here. To enter my drawing, simply leave a comment here on my blog post. Be sure I know how to reach you. Then hop on over to the next blog, enter the next giveaway, and hop on to the next...! We will be selecting winners at random on June 13, 2014. My giveaway is a little magnet. It sticks well to my fridge, and hopefully soon it will decorate yours. The magnet features two of the latest releases of Roc Nicholas Rubber Stamps: Flying Pig and When Pigs Fly Text. The pig is adhered with a pop dot which adds some dimension to the piece.June 13, 2014. What a fabulous piece of art, Cathy, I'm rather taken with the flying pig! So cute! I think this is my favorite stamp!! Cathy, What a WONDERFUL piece of art! I LOVE it! Thanks for sharing your talent! What a cool creation, you've really made Roc's stamps shine. Fabulous -I love Roc's flying pig! Unique design for this flying pig who is taking high five's from all of us! Hope this lovely piece of mail art will be flying from your coast to mine! What a cute idea... A magnet with a flying pig! Luv it! 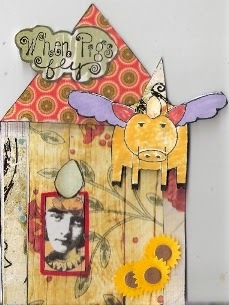 I love this piece, Cathy - great way to add a stamped piece into your artwork! What a wonderful magnet, I love it, that's a real little piece of art!!! Thanks for giving it away to one lucky winner! Fabulous idea to create a fridge magnet. I like the face peeking through the window - brilliant!